NU: Claridge 3-7-0 27; Faiman 4-5-0 55; Tucker 3-3-0 46; McCloughan 0-1-0 0; Theisen 1-1-0 14. SD: Janvrin 2-7; Hannah 1-10; Donnelly 1-minus-3. NU: Bryan 1-29; McCloughan 2-23; Tomlinson 1-20; Stuewe 1-14; Martin 1-14; Vujevich 1-14; Callahan 1-12; Theisen 1-4; Ross 1-3. 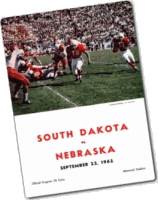 In Bob Devaney’s debut as Nebraska’s head coach, the Huskers opened the 1962 season by pounding undermanned South Dakota, 53-0, at Memorial Stadium. With eight different players scoring TDs, the Huskers led 19-0 at halftime, and then added 20 points in the third quarter and 14 in the fourth. Nebraska had 27 first downs to the Coyotes’ six.